For the jockey, see Jason Weaver (jockey). For the English cricketer, see Jason Weaver (cricketer). Jason Michael Weaver (born July 18, 1979), also known by his stage name J-Weav, is an American actor and singer best known for his roles as Marcus Henderson on The WB sitcom Smart Guy, Jerome Turrell on the short-lived ABC sitcom Thea from 1993–1994, and the pre-teenaged Michael Jackson on the 1992 ABC miniseries The Jacksons: An American Dream. Jason was also the singing voice of the young Simba in Walt Disney Feature Animation's 1994 film The Lion King . A stage name is a pseudonym used by performers and entertainers, such as actors, comedians, singers and musicians. Such titles are adopted for a wide variety of reasons and may be similar or nearly identical to an individual's birth name. In some situations, a performer will eventually adopt his or her title as a legal name, although this is often not the case. Personal names or nicknames that make up the professional name should not necessarily be considered as a "fake name" like Lady Gaga : for example: Miley Cyrus: born Destiny Hope Cyrus, uses her personal nickname "Miley" and her maiden name "Cyrus" as her professional name, in 2018 she legally changed to Miley Ray Hemsworth. 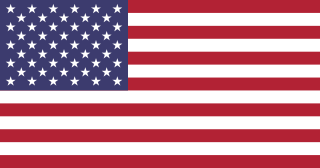 Americans are nationals and citizens of the United States of America. Although nationals and citizens make up the majority of Americans, some dual citizens, expatriates, and permanent residents may also claim American nationality. The United States is home to people of many different ethnic origins. As a result, American culture and law does not equate nationality with race or ethnicity, but with citizenship and permanent allegiance. One of Weaver's earliest acting roles was on Oprah Winfrey's 1990 television series Brewster Place . He went on to portray a young Michael Jackson in the 1992 miniseries The Jacksons: An American Dream , as well as starring on the television sitcoms Thea (1993–1994) and Smart Guy (1997–1999). Jason was also the singing voice of young Simba in Walt Disney Feature Animation's 1994 film The Lion King. Oprah Winfrey is an American media executive, actress, talk show host, television producer and philanthropist. She is best known for her talk show The Oprah Winfrey Show, which was the highest-rated television program of its kind in history and was nationally syndicated from 1986 to 2011 in Chicago. Dubbed the "Queen of All Media", she was the richest African American of the 20th century and North America's first black multi-billionaire, and has been ranked the greatest black philanthropist in American history. She has also been sometimes ranked as the most influential woman in the world. Brewster Place is an American drama series which aired on ABC in May 1990. The series was a spinoff of the 1989 miniseries The Women of Brewster Place, which was based upon Gloria Naylor's novel of the same name. The series starred talk show host Oprah Winfrey, who also served as co-executive producer. In 2002, Weaver appeared in Drumline with Nick Cannon, followed by a role in The Ladykillers in 2004. In 2004, he also was a featured artist in the song One Call Away as well as in the music video that also starred Keshia Knight Pulliam and AND1 baller Phillip "Hot Sauce" Champion. In 2006, Weaver was featured in a supporting role in the film ATL starring rappers T.I. and Big Boi from OutKast. He also appears as an extra in the music video "Rock Yo Hips" by Crime Mob featuring Lil Scrappy and "Make Up Bag" by The-Dream featuring T.I. In 2011, he starred in the film He's Mine Not Yours alongside Caryn Ward, Wendy Raquel Robinson, Carl Anthony Payne II and Clifton Powell. Drumline is a 2002 American film directed by Charles Stone III. The screenplay, which was inspired by The Southwest Dekalb High School Drumline, written by Tina Gordon Chism and Shawn Schepps. The story is about a young drummer from New York, played by Nick Cannon, who enters the fictional Atlanta A&T University and bumps heads with the leader of his new school's drum sectionals. Zoe Saldana, and Orlando Jones co-star. Nicholas Scott Cannon is an American actor, singer, rapper, producer, television host and activist. On television, Cannon began as a teenager on All That before going on to host The Nick Cannon Show, Wild 'N Out, America's Got Talent, Lip Sync Battle Shorties and The Masked Singer. He acted in the films Drumline, Love Don't Cost a Thing and Roll Bounce. The Ladykillers is a 2004 American black comedy thriller film directed by Joel and Ethan Coen. The Coens' screenplay was based on the 1955 British Ealing comedy film of the same name, written by William Rose. The Coens produced the remake, together with Tom Jacobson, Barry Sonnenfeld and Barry Josephson. It stars Tom Hanks, Irma P. Hall, Marlon Wayans, J. K. Simmons, Tzi Ma and Ryan Hurst, and marks the first time that the Coens have worked with Tom Hanks. This was the first film in which Joel and Ethan Coen share both producing and directing credits; previously Joel had always been credited as director and Ethan as producer. Simba is a fictional character who appears in Disney's The Lion King franchise. Introduced in Walt Disney Animation's 32nd animated feature film The Lion King (1994), the character subsequently appears in its sequels The Lion King II: Simba's Pride (1998) and The Lion King 1½ (2004) as well as the upcoming 2019 remake of the original film directed by Jon Favreau. Walt Disney Animation Studios (WDAS), also referred to as Disney Animation, headquartered at the Walt Disney Studios in Burbank, California, is an American animation studio that creates animated feature films, short films and television specials for The Walt Disney Company. Founded on October 16, 1923, it is a division of Walt Disney Studios. The studio has produced 57 feature films, from Snow White and the Seven Dwarfs (1937) to Ralph Breaks the Internet (2018). The Lion King is a 1994 American animated musical film produced by Walt Disney Feature Animation and released by Walt Disney Pictures. It is the 32nd Disney animated feature film, and the fifth animated film produced during a period known as the Disney Renaissance. The Lion King was directed by Roger Allers and Rob Minkoff, produced by Don Hahn, and has a screenplay credited to Irene Mecchi, Jonathan Roberts, and Linda Woolverton. Its original songs were written by composer Elton John and lyricist Tim Rice, with a score by Hans Zimmer. The film features an ensemble voice cast that includes Matthew Broderick, James Earl Jones, Jeremy Irons, Jonathan Taylor Thomas, Moira Kelly, Nathan Lane, Ernie Sabella, Rowan Atkinson, Robert Guillaume, Madge Sinclair, Whoopi Goldberg, Cheech Marin, and Jim Cummings. The story takes place in a kingdom of lions in Africa and was influenced by William Shakespeare's Hamlet. Howard Bailey Jr., better known by his stage name Chingy, is an American rapper, singer, producer, and actor. "One Call Away" is a song by American rapper Chingy, featuring actor Jason Weaver singing the chorus, credited as J-Weav. It's the third and final single off his debut album Jackpot (2003). The song was kept from being number one by Usher's "Yeah!" for five consecutive weeks, peaking at number two on the US Billboard Hot 100. It became a number one hit on the Hot Rap Songs chart for three weeks and peaked at numbers 3 and 6 on the Hot R&B/Hip-Hop Songs and Mainstream Top 40 charts respectively. It also reached the top 40 in countries like Australia, Ireland, New Zealand and the UK. A video for the single was released that featured actress Keisha Knight-Pulliam and streetball player Philip "Hot Sauce" Champion. Love Ambition is the debut album by actor and singer by Jason Weaver. It was released on June 27, 1995 through the label Motown Records. The album contains the singles "Love Ambition ", and "I Can't Stand the Pain". A Goofy Movie is a 1995 animated comedy film produced by Disney MovieToons and Walt Disney Television Animation and distributed by Walt Disney Pictures. The animated directorial debut of Kevin Lima, the film is based on The Disney Afternoon television series Goof Troop created by Robert Taylor and Michael Peraza Jr., and acts as a follow-up to the show. Taking place a few years after the events of Goof Troop, A Goofy Movie follows Goofy and his son, Max, who is now in high school, and revolves around the father-son relationship between the two as Goofy takes Max on a fishing trip out of fear that Max is drifting away from him, unintentionally interfering with Max's social life, particularly his relationship with Roxanne, his high school crush. It features the voices of Jason Marsden, Bill Farmer, Jim Cummings, Kellie Martin, Pauly Shore, Jenna von Oÿ, and Wallace Shawn, and prominently features the singing voice of Tevin Campbell as Powerline, a fictional pop star. The film was also dedicated to Pat Buttram, who died during the film's production. The Lion King II: Simba's Pride is a 1998 American animated direct-to-video romantic musical film and a sequel to Disney's 1994 animated feature film, The Lion King. The story takes place in a kingdom of lions in Africa and was influenced by William Shakespeare's Romeo and Juliet. According to co-director Darrell Rooney, the final draft gradually became a variation of Romeo and Juliet. The Lion King's Timon & Pumbaa, often simply referred to as Timon & Pumbaa, is an American animated television series created by Walt Disney Television Animation. Based on the 1994 Disney animated film The Lion King, it centers on Timon the meerkat and Pumbaa the warthog, as they live their problem-free philosophy Hakuna Matata. The show ran for three seasons on CBS, Disney Channel, Toon Disney, and in syndication as a part of The Disney Afternoon. It aired from September 8, 1995 to September 24, 1999. It is also the first The Lion King related media to feature humans, as humans did not appear in the film. It is the first of two television series to be based on the film, the second being The Lion Guard. 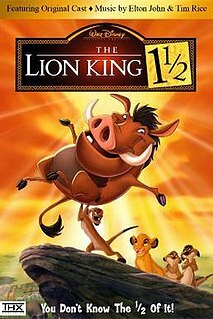 The Lion King ​1 1⁄2 is a 2004 American animated comedy adventure film produced by the Australian branch of Disneytoon Studios and released direct to video on February 10, 2004. The film was also theatrically released internationally and in selected cities in the United States. As the third film in the Lion King media franchise, the film is chronologically the second in the franchise. It focuses on the meerkat/warthog duo Timon and Pumbaa and their escapades taking place before and during the events of The Lion King. Much of the original cast from the first film returns in this film to reprise their roles, including Nathan Lane and Ernie Sabella as Timon and Pumbaa, respectively. Circle of Life: An Environmental Fable was a 70 mm film, shown in the Harvest Theater in The Land pavilion at Epcot in Walt Disney World, Orlando, Florida. It opened on January 21, 1995, replacing Symbiosis. The focus of the story was Simba. Moira Kelly is an American actress. She is best known for portraying Kate Moseley in the 1992 film The Cutting Edge, as well as single mother Karen Roe on the teen drama One Tree Hill. She is also known for playing the role of Donna Hayward in Twin Peaks: Fire Walk with Me, replacing Lara Flynn Boyle in the prequel to the 1990 TV series Twin Peaks. Other roles include Dorothy Day in Entertaining Angels: The Dorothy Day Story, White House media consultant Mandy Hampton in the first season of The West Wing, and the voice of Simba's love interest Nala in The Lion King and its sequel The Lion King II: Simba's Pride. She also played Hetty Kelly and Oona O'Neill in Chaplin. Madge Dorita Sinclair was a Jamaican actress, best known for her roles in Cornbread, Earl and Me (1975), Coming to America (1988), Trapper John, M.D. (1980–1986), and the ABC TV miniseries Roots (1977). Sinclair also voiced the character of Sarabi, Mufasa's wife and Simba's mother, in the animated feature film The Lion King. Sinclair won the Primetime Emmy Award for Outstanding Supporting Actress - Drama Series for her role as Empress Josephine in Gabriel's Fire in 1991. Timon and Pumbaa are an animated meerkat and warthog duo introduced in Disney's 1994 animated film The Lion King and its franchise. Timon was portrayed through his many appearances by Nathan Lane, Max Casella, Kevin Schon, Quinton Flynn, Bruce Lanoil in the Wild About Safety shorts and Kingdom Hearts II, and while Pumbaa is voiced by Ernie Sabella, and was portrayed by Tom Alan Robbins in the original cast of the Broadway musical. In the upcoming live-action remake, the characters will be portrayed by Billy Eichner and Seth Rogen respectively. Nathan Lane and Ernie Sabella first came to audition for the roles of the hyenas, but when the producers saw how well they worked together they decided to cast them as Timon and Pumbaa. Lyricist Tim Rice however was pulling for Rik Mayall and Adrian Edmondson to play the roles, as he got the idea for the lyrics to "Hakuna Matata" by watching their show Bottom. Jason Raize Rothenberg, known professionally as Jason Raize, was an American actor, singer and former Goodwill Ambassador for the United Nations Environment Programme. He was best known for his roles as the adult Simba in the Broadway stage musical version of The Lion King and the voice of Denahi in the animated Disney film Brother Bear. Donald Paul Hahn is an American film producer who is credited with producing some of the most successful animated films in recent history, including The Lion King and Beauty and the Beast, the first animated film to be nominated for the Oscar for Best Picture. He currently is Executive Producer of the Disneynature films, and owns his own film production company, Stone Circle Pictures. "I Just Can't Wait to Be King" is a song from Disney's 1994 animated film The Lion King. With music by Elton John and lyrics by Tim Rice, the song is performed by American actor and singer Jason Weaver in his role as Simba, while American actress Laura Williams and English actor Rowan Atkinson provide backup vocals in their roles as Nala and Zazu. "Circle of Life" is a song from Disney's 1994 animated film The Lion King. Composed by Elton John, with lyrics by Tim Rice, the song was performed by Carmen Twillie and Lebo M. as the film's opening song. In an interview, Rice said he was amazed at the speed with which John composed: "I gave him the lyrics at the beginning of the session at about two in the afternoon. By half-past three, he'd finished writing and recording a stunning demo." Elton John sang a pop version of the song with the London Community Gospel Choir, which was included in the film's soundtrack and made into a music video. The Lion King is a Disney media franchise comprising a film series and additional media. The success of the original 1994 American animated feature, The Lion King, directed by Roger Allers and Rob Minkoff, led to two direct-to-video sequel films, an upcoming 2019 film, a television film sequel, two spin-off television series, three educational shorts, several video games, merchandise, and the third-longest-running musical in Broadway history, which garnered six Tony Awards including Best Musical. The franchise as a whole has EGOT-ed, meaning it has won the four biggest awards of American show business. The 27th Annual Annie Awards were held on November 6, 1999. Creative Capers Entertainment is an American animation studio founded by Terry and Sue Shakespeare with David Molina in 1989. Based in Altadena, California. It specializes in flash and hand-drawn animation in various feature films, television series, commercials, CD-ROMs and video games. The studio is populated by animators who worked in Sullivan Bluth Studios Ireland, Ltd. including Mark Koetsier, Silvia Hoefnagels, Stefan Fjeldmark, Greg Tiernan, Shane Zalvin, etc. It also operates a division called Creative Capers Cartoons, also known as The Hollywood Cartoon Company, which was mainly used for providing additional animation for some feature films. The studio was also an uncredited additional animation facility for Beauty and the Beast, Aladdin and The Lion King. Christopher Neal Jackson is an American actor, singer, musician, and composer. He began his career in 1995 starring in the Off-Broadway musical Time and the Wind by composer Galt MacDermot when he was just 20 years old. He made his Broadway debut in 1997 as an ensemble member in the Original Broadway Cast of Disney's The Lion King. He remained with the show for several years, ultimately taking over the role of Simba. He went on to perform leading roles in several more Broadway musicals and plays, including After Midnight, Bronx Bombers, Holler If Ya Hear Me, and Memphis. He drew critical acclaim in several projects with Lin-Manuel Miranda: originating the roles of Benny in In the Heights and George Washington in the smash hit Hamilton. For the latter role he was nominated for a Tony Award for Best Featured Actor in a Musical. He also collaborated with Miranda on the Disney film Moana in which he provides the singing voice of Chief Tui. His other film work includes secondary roles in After.Life and Tracers. ↑ "Jason Weaver filmography credits". movies.yahoo.com. Retrieved 2008-09-26. ↑ "Discography - Jason Weaver". billboard.com. Retrieved 2008-09-26. ↑ "Artist Chart History - Chingy". billboard.com. Retrieved 2008-09-26.